1. MINING - Uranium (or thorium). 2. MILLING – transportation to millworks, taking the raw ore and converting it to "yellowcake" uranium ore.
3. CONVERSION - Construction of the uranium conversion facility, transportation of the uranium "yellowcake" to a conversion facility, dissolving it to form UF6, conversion of "yellowcake" to UF6. 4. ENRICHMENT - Construction of the uranium enrichment facility, construction of the cylinders used to transport the UF6, transportation of the UF6 to the enrichment facility, enrichment of the uranium. 5. FUEL PELLETS - Formation of uranium fuel pellets, transportation of the uranium fuel pellets. 6. NUCLEAR POWER PLANT CONSTRUCTION - Construction of the nuclear power plant, with its massive amounts of concrete and steel, which will take several years of using heavy construction equipment to complete. Keep in mind that both steel and concrete production are carbon-intensive. 8. GENERATORS - Use of heavy-duty diesel generators to run the cooling system during routine maintenance, refueling, shut downs resulting from increased summertime water temperatures, any SCRAM, and power outage emergencies. 9. WASTE STORAGE - Building RadWaste storage facilities, building radwaste storage containers and transporting the waste to the storage facilities. Transfering RadWaste from one geographic location to another, across the country, or the ocean. 10. WASTE PROCESSING - Building reprocessing facilities, transporting the radwaste to the reprocessing facility, reprocessing the radwaste, building storage for the radwaste generated by reprocessing. 11. WASTE INCINERATION - Building radwaste incineration facilities, transporting the waste to the incineration facility, incinerating the RadWaste. 12. WASTE VITRIFICATION - Building vitrification plants, transporting waste to vitrification plants, vitrifying the RadWaste involving heating the materials to very high temperatures. 13. MONITORING OF RADIOACTIVE WASTE - carbon pollution generated by monitoring and guarding the radwaste for eternity. 14. DECOMISSIONING AND DECONTAMINATION -decontaminating and demolishing the nuclear plants, reactors, enrichment facilities, and other support infrastructure. 15. ACCIDENTS - mitigation and clean-up efforts on nuclear accidents-huge carbon contribution. 16. DAMAGED REACTORS AND ACCIDENTS - Building sarcophagus structures around failed nuclear power facilities. Monitoring, securing and periodically re-entombing failed nuclear power facilities for all eternity. 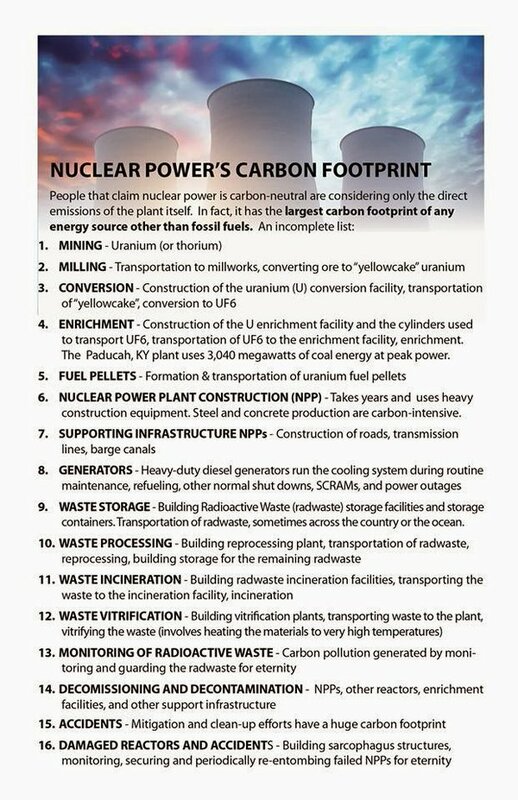 There are more nuclear carbon-footprint considerations than the ones stated here, but this list is a good general start.No one source has actually calculated the carbon footprint for nuclear energy taking into consideration all of the above sources of carbon emissions. Comment: I'd add that France grossly under estimated the cost to decommission their reactors and now has had to add a special energy tax to try and help pay for future decommissioning! Nuclear will continue to be ever more expensive as new Solar costs continues to decline, especially in Countries like Germany that are early adopters of Solar (of all flavors) Energy! France in order to become competitive, needs to start decommissioning their nuclear reactors ASAP, and they would be well advised to seek financial help from those Countries (like Germany) who are located "downwind" from France, who would be far safer if France did not continue to have the RISK of a European Fukushima hanging over their heads! It is time that France join with its neighbors and develop a European Energy GRID that will power everyone well into the 21 Century; any thing less will only result in regional geo-Energy politics that will doom them all to a life of less or even one or more potential Fukushima-type disasters which would devastate all of Europe!